The color is rich, the drape is fluid, and the pattern in the lustrous cloth is eye-catching. “Kuvikas to taqueté” was not an easy project. Eight shafts, double treadling, and double-bobbin shuttles with slick 8/2 Tencel weft. But the fabric is incredible! 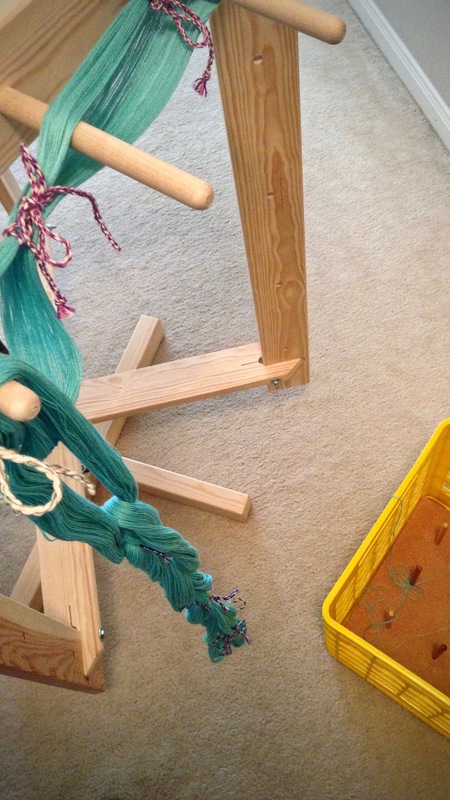 Warp chain of 8/2 cotton hanging from warping reel. Thanks to a unusual tie-up, two treadles are pressed simultaneously, something I had not thought possible for a countermarch loom. I started with kuvikas (summer and winter), which has tabby picks between the pattern picks. 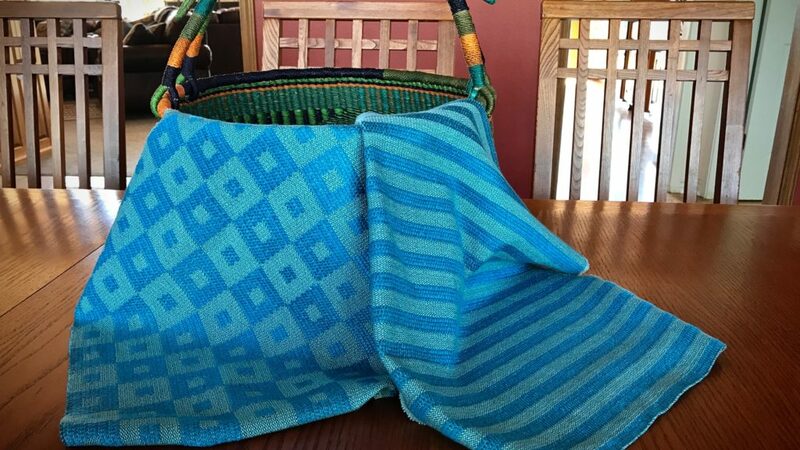 The dark teal 8/2 cotton tabby weft and the bright teal Tencel pattern weft produce a tone-on-tone effect for the square and stripe patterns. These two pieces will become the front and back of a throw pillow. Kuvikas panel 1 complete. I always use red thread for a cutting line between pieces, so there is no accidental cutting in the wrong place. I then changed the treadle tie-up to switch from kuvikas to taqueté. The taqueté has no tabby weft. 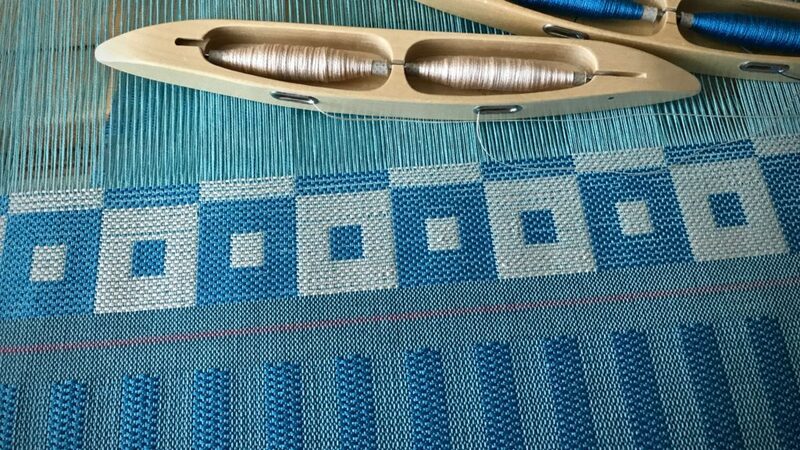 The teal and cream Tencel weft threads lay back-to-back, producing a double-faced fabric. This piece is being used as a table runner. Stripes in kuvikas, and then square pattern in taqueté after changing the treadle tie-up. Finished kuvikas glistens in the sunlight. 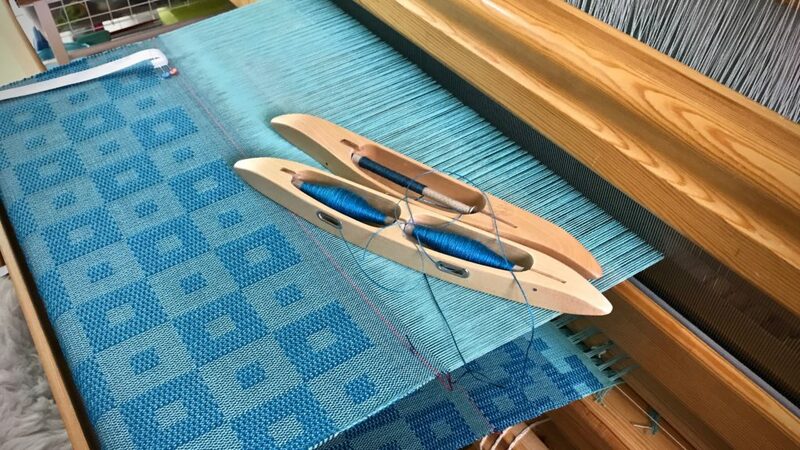 Enjoy the little slideshow video I made for you that follows the process from three lovely aquamarine warp chains to fabric glistening in the sun on a Texas hill country table. May you finish something that is not easy. Do you remember my Handwoven Thick and Thin Towels (that appeared on the cover of Handwoven), and my Black and White Towels (These Sensational Towels)? I will be teaching a workshop on that thick and thin technique at Shoppes at Fleece ‘N Flax in beautiful Eureka Springs, Arkansas August 24 – 26, 2017. You’re welcome to join us! I’d love to see you there! Contact the shop at the number below if you are interested. They’re all going to be beautiful, Karen! Beth, that’s so kind of you! Thanks! Karen, these towels are stunning. What an interesting technique. Martha, I agree. It is an interesting technique. It’s surprising what different tie-ups can produce. Beautiful video and great toe tapping music to go along with it! Love your work! Thanks so much, Shari! I always love a good tune, too.